Takeaway: Creating a hearing conservation program can seem daunting, but it can be broken down into five simpler steps. From ticking clocks to honking horns to music, we’re exposed to almost constant noise every day. Sometimes it’s pleasant, like a bird chirping its song; other times, it's more like nails on a chalkboard. Our workplaces are not immune to noise. In fact, people commonly experience the loudest noise at work. And the many kinds of occupational noise surrounding us – hammering, heavy equipment, sirens, machinery, vehicles – can take a toll on our hearing. Loud noise is a serious threat to a worker's hearing because once hearing loss becomes permanent, it can’t be recovered. In this article, we'll go over the five principles that will help you protect your workers' hearing. To protect against damage from excessive noise, OSHA requires the implementation of an effective hearing conservation program, consisting of five principles. OSHA requires that supervisors monitor work areas to identify employees who are exposed to an 8-hour time-weighted average (TWA) of 85 decibels (dB) or higher. Monitoring records should be maintained and kept for at least two years. If the results of noise monitoring indicate excessive sound levels, employers must identify engineering or administrative changes that could reduce noise levels. Engineering adjustments can include soundproofing, installing a muffler, or building an acoustic barrier. On the administrative side, a simple scheduling change can make a big difference, as businesses can opt to operate noisy machines during work shifts in which fewer people are exposed. All employees exposed to 85 dB TWA or higher must have a baseline audiogram within 6 months of the first exposure, and every year after that. Supervisors must conduct annual training sessions on the proper use of hearing protection. Employees working in areas where noise is 85 dB TWA or higher must be provided with appropriate hearing protectors, such as ear plugs, ear muffs, and ear canal caps. These must be supplied at no cost to them. Safety personnel must offer devices with a sufficient Noise Reduction Rating (NRR). NRR is the measure, in decibels, of how well a hearing protector reduces noise, as specified by the Environmental Protection Agency. The higher the number, the greater the noise reduction it provides. When noise control measures are not feasible or during the time it takes to implement necessary controls, using hearing protection devices prevents hazardous levels of noise from damaging the inner ear. 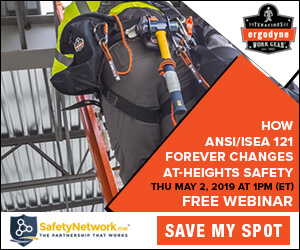 Current advancements in the industry provide safety personnel and workers more choices than ever. There are three types of hearing protection PPE: ear plugs, ear muffs, and ear canal caps. Ear plugs are inserted inside the ear canal and are often recommended for users wearing them for extended periods of time. Ear muffs feature cushions that cover the entire ear and block out sound. They should fit snugly in order to create a tight seal. While ear muffs are easy to use, they often have a lower NRR than ear plugs. Muffs are suggested for workers who periodically enter and leave a noisy environment, rather than those who are continuously exposed to high levels of noise. Some ear muffs are designed to be used with other personal protective equipment. Cap-mount muffs, for example, are compatible with hard hats. Ear muffs can also be equipped with AM/FM radio or Bluetooth capabilities. These models are very popular with employees and can help boost both compliance and morale. These devices are equipped with a tensioned band that keeps the plug ends capped over the ear canal, instead of being inserted. Like muffs, they generally have a lower NRR than plugs and are recommended for employees who enter and leave noisy work areas intermittently. Canal caps also leave the worker cooler than muffs, making them a great choice for hot working environments. Simply handing out ear plugs or ear muffs isn’t enough. Training is necessary and teaches employees about the dangers of loud noise and hearing loss. Workers should leave the training session able to identify noise hazards; understand how those hazards can affect them; and know how to select, wear, and maintain hearing protection. Workers can also use training sessions as opportunities to ask questions and talk about safety concerns. Their input is valuable, and this is one of the few situations in which you can get it organically. Implementing a hearing conservation program may seem complicated, but it's well worth the effort. OSHA research indicates that workplaces with adequate and effective conservation programs have higher levels of productivity and lower incidences of absenteeism. By following the five principles laid out above, you can break it down into manageable steps and start protecting your workers' hearing.